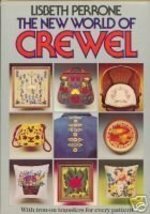 The New World of Crewel by Lisbeth Perrone Copyright 1975. Printed by Random House, Inc., . The most exciting feature of The New World of Crewel is that at the back of the book there is a transfer for every design. No tedious tracing or elaborate graph-paper enlargement is necessary. Book Description The book is in very good condition and seems to be unused. It is a little musty. The dust jacket is in very good condition with some tiny tears on the edges. The book covers such topics as choosing a design, starting a project, the stitches, blocking and mounting. 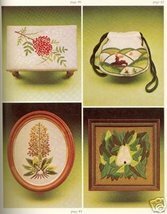 There are 40 original designs that can be embroidered in yarn on articles of clothing, furniture, purses, pillows, pictures and any other object made of fabric. There appears to be a small color illustration for each of the designs in addition to large scale black and white illustrations for the stitches and design color charts. All books are vintage items and soldâAS IS. I attempt to represent my goods as honestly as possible, but sometimes something will get by. If you have any doubts about an item, E-MAIL ME! I want to make sure that you will be pleased with your purchase. I will make a refund as merchandise credit; buyer pays for return shipments.